Since 1935 Thule had been scouting for a remote, inconspicuous, underdeveloped testing ground for such a craft. Thule found a location in Northwest Germany that was known as (or possibly designated as) Hauneburg. At the establishment of this testing ground and facilities the SS E-IV unit simply referred to the new Thule disc as a product – the “H-Gerät” (Hauneburg Device). The early Haunebu I craft of which two prototypes were constructed were 25 meters in diameter, had a crew of eight and could achieve the incredible initial velocity of 4,800 km/h, but at low altitude. Further enhancement enabled the machine to reach 17,000 km/h! Flight endurance was 18 hours. To resist the incredible temperatures of these velocities a special armor called Victalen was pioneered by SS metallurgists specifically for both the Haunebu and Vril series of disc craft. The Haunebu I had a double hull of Victalen. The early models also attempted to test out a rather large experimental gun installation – the twin 60mm KraftStrahlKanone (KSK) which operated off the Triebwerk for power. It has been suggested that the ray from this weapon made it a laser, but it was not. When a Vril 7 was downed by the Russians in 1945 a similar underbelly mounted KSK gun was destroyed with debris recovered from the battle site. Postwar the strange metal balls and tungsten spirals that made up the weapon could not be identified. But recently it has been speculated that the Triebwerk-connected balls formed cascade oscillators that were connected to a long barrel-shrouded transmission rod wrapped in a precision tungsten spiral, or coil to transmit a powerful energy burst suitable to pierce up to 4” of enemy armor! The heavy gun installation, however, badly destabilized the disc and in subsequent Haunebu models lighter MG and MK cannon were supposedly installed (although it is not apparent from any photographic source, being an internal installation of six MK-108s in an upper and lower triple gun pack). The Haunebu I first flew in 1939 and both prototypes made 52 test flights. In 1942, the enlarged Haunebu II of 26 meters diameter was ready for flight testing. This disc had a crew of nine and could also achieve supersonic flight of between 6,000-21,000 km/h with a flight endurance of 55 hours. Both it and the further developed 32 meter diameter Do-Stra had heat shielding of two hulls of Victalen. Seven of these craft were constructed and tested between 1943-44. The craft made 106 test flights. By 1944, the perfected war model, the Haunebu II Do-Stra (Dornier STRAtosphären Flugzeug) was tested. Two prototypes were built. These massive machines, several stories tall, were crewed by 20 men. They were also capable of hypersonic speed beyond 21,000 km/h. The SS had intended to produce the machines with tenders for both Junkers and Dornier but in late 1944/early 1945 Dornier was chosen. The close of the war, however, prevented Dornier from building any production models.Yet larger still was the 71 meter diameter Haunebu III. A lone prototype was constructed before the close of the war. It was crewed by 32 and could achieve speeds of between 7,000 – 40,000 km/h! It had a triple Victalen hull. It is said to have had a flight endurance of between 7-8 weeks! The craft made 19 test flights. This craft was to be used for evacuation work for Thule and Vril in March 1945. Named Ostara, after the old Germanic goddess of the East, dawn, rebirth, and resurrection, the overloaded Haunebu III may have been boostered by a cluster of A-9/A-10 rockets to get it into the air with SS General Hans Kammler onboard. Subsequent postwar claims that this craft was ultimately used for a suicide mission to Mars is completely unfounded; even with onboard SS oxygen generators and modified Draeger Werke pressure suits there is no way this machine could withstand an eight month journey to Mars. What would be the purpose anyway? The Gesellschaften were aiming at channeled flight not conventional space flight. Further plans for a 120 meter diameter Haunebu IV were in the works but no such craft is known to have been constructed before the end of the war. 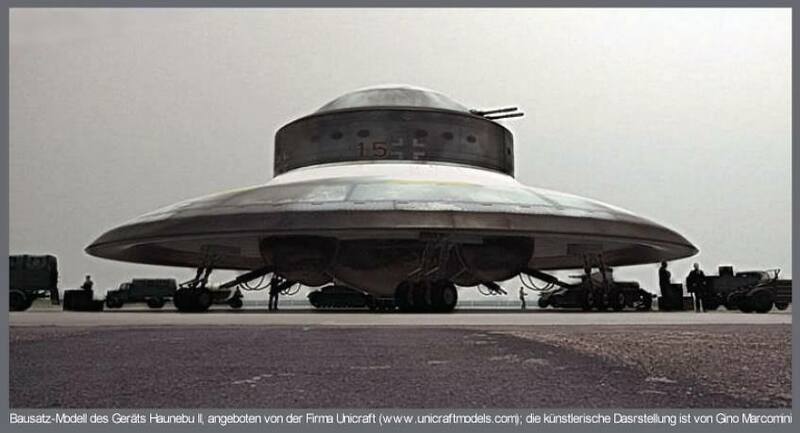 However, many Haunebu craft were spotted over occupied Germany in the years to follow – among them, a craft strongly resembling the Haunebu IV by the Bundeswehr in the 1970s. It is believed that all of the mysterious Haunebu craft were evacuated to a sanctuary outside of Third Reich borders; to Neu Schwabenland, Antarctica – Base 211, constructed during the war. 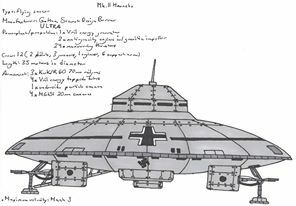 In the years following the close of WW2, many Haunebu-shaped disc craft have been spotted all over the world leading to speculation that either the Third Reich survived in another part of the world (primarily in Argentina) or that the victorious Allies had captured the Thule and Vril technology and constructed similar craft. The BRD (Federal Republic of Germany) is also suspected of retaining Thule and Vril technology with official designations of FU-1 and FU-2 (Fliegende Untertassen 1 & 2). 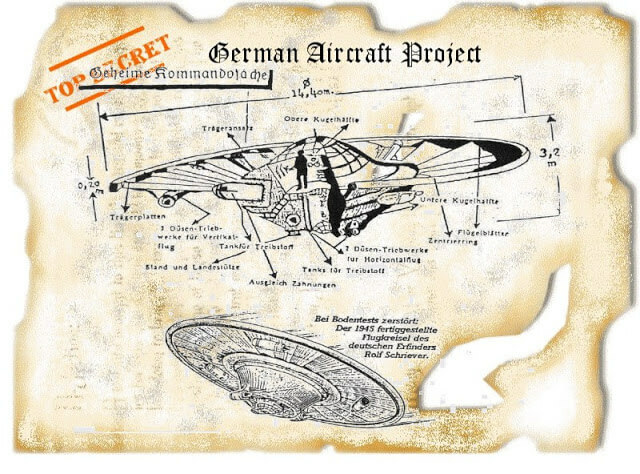 The U.S.S.R. research with the German occult technologies is unknown due to Cold War secrecy; however, the Soviets are believed to have captured several of Schauberger’s Repulsin models, Flugkreisel engineer Otto Habermohl, and Feuersturm engineer Gerhard Falker in 1945. Although the Soviets had their own disc designs based on the Suchanov series of “Discoplans” from 1958-62 and a rumored experimental circular-wing MiG prototype, the SS Haunebu type might have been experimented with as well since the Soviets got a good share of Dr. Franz Philipp’s beam weaponry in Berlin which was part of the SS E-IV Technical Branch. Who knows what other E-IV secrets they got in Berlin as well.